A fiber optic installation contractor needed to acquire multiple brands and types of equipment in a short time period to take advantage of new business contracts. In their sixth year in business, they were awarded a very large, long-term contract that required significant investment in equipment at different locations throughout the U.S. – trenchers, trailers, skid steers, vacuum excavators, and more. The equipment investment per location was over $1MM. The variety of equipment types required that they purchase multiple brands through multiple dealers, meaning their traditional dealer-leasing / point of sale method was not going to work. CCG created a financial package which refinanced their existing leases and added new equipment purchases, which provided terms to consolidate the number of payments to match the length of their contract work. This enabled them to acquire new equipment as needed, and, ensure the equipment would be paid off when a particular contract had expired. They have acquired nearly $5 million in equipment over the past four years, and their debt service and cash flow continue to be manageable letting them do what they do best. 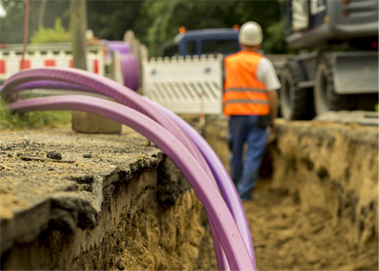 Background: Founded in the late 2000’s, this cable installation and communication services contractor pioneered installation methods and techniques that out-performed industry standards in the fiber optic cable installation industry. This helped them grow quickly, add services, and attract high-profile customers. They are now a leading provider of these services across the country. In the beginning, they acquired the equipment needed for their business, mostly through captive leasing programs. But as they were awarded larger contracts that required additional types of equipment, they realized they needed a different approach to equipment financing. With multiple brands and equipment types, the size and scope of their needs had outgrown their previous leasing solution. Get a PDF version of this story.